There are a lot of focaccia recipes floating around out there and many of them are pretty good. Others, are not so great. Some are just glorified pizza doughs overladen with toppings and others are drenched in oil…vegetable oil! Yuck. After my first visit to Liguria many years ago, I had perfect focaccia. The kind that I wanted for breakfast, lunch, and dinner. Sometimes I preferred mine topped with olives and other times with caramelized onions (Italians do not mix focaccia toppings the way Americans do), but I always came back to the plain for testing the real quality of fantastic focaccia. First, it must have a lingering flavor that is not of flour, but rather an almost sour, barely there tang. Second, the texture must be perfect. The outside must have the slightest bit of crunch while the inside is doughy without being underdone, a quality that bakers describe as “chewy,” but that word never sounds all that palatable to me. This hard-to-explain inner texture is the mark of a truly fantastic focaccia because it means that it has been kneaded (or beaten, in my case) until unfathomably long strands of gluten develop in the dough so that, despite its very high water to flour ratio (i.e. a very wet, almost batter-like dough) it has a unified texture. It results in a sort of webbing of dough so that each bite has tiny little pockets of air without huge bubbles. The dough is incredibly stretchy and elastic. I have been on the hunt for a perfect focaccia recipe for over a year now. This week I tinkered with a recipe that I made four times in about as many days. The long rise adds the same lingering flavor as I described in my ciabatta bread and the 20 minute “kneading” time in the mixer develops an incredible texture. Now the most recent non-Ligurian, but still Italian focaccia that I have eaten is from a little bakery in downtown Ivrea. The texture is not quite as perfect as the focaccia I had been in search of, but the flavor balance spot on. 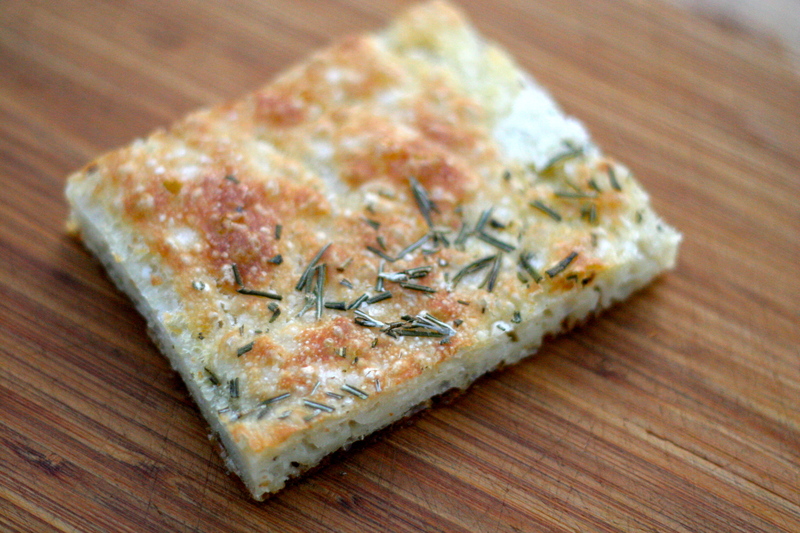 The final secret to my ideal focaccia is medium-large bits of sea salt generously sprinkled over the top of the dough. It may seem like a ridiculous amount of salt to sprinkle on top, but keep in mind that you will not be putting any salt at all in the actual dough as it rises. The contrast of the salt flavor and crunch with the bread itself is magnificent. So much so that the last piece of focaccia from my last loaf was carried off by a horde of pigeons last night after our picnic dinner in Golden Gate Park. Live it up pigeons. In a standing mixer (Kitchen Aid or similar) with the paddle attachment, mix the flour and yeast on low-speed, slowly adding the water until it is a unified dough, about 1 minute. Turn the speed up to medium (4 or 6 on a Kitchen Aid) and beat for 20 minutes until really long strands of dough appear and the dough forms into a sort of ball. Sometimes it does, sometimes it doesn’t. As long as you really let it beat for 20 minutes you will be fine. Oil a large bowl and scrape the dough into the bowl for its first rise. If you are quick about it, you an even lift the entire dough on the paddle from the mixer and drop it in one mass into the oiled rising bowl. Let it rise in a medium heat (75-80 degrees, I usually put it in my unlit oven to proof) for about four hours until it doubles its size. Oil a rimmed baking sheet, about 12 x 17 inches with about 2 tablespoons of the extra virgin olive oil, taking care that every surface is covered, I use a pastry brush or my bare hands. Carefully scrape the risen dough from the bowl into the baking sheet so that you don’t deflate the dough. With oiled fingertips, try to stretch the dough to the corners. You won’t succeed. It will shrink back a bit because of the gluten. Try again in 10 minutes and then call it, it will mostly fit into the pan fine while cooking. Cover the pan with a lid or greased plastic wrap and let rise until double for about 1 1/2 or 2 hours. About an hour into this final rise, place a baking stone onto the lowest level of the oven and turn it on to 475F degrees to preheat for about an hour. When it has doubled in size, drizzle the last 1 or 2 tablespoons of olive oil over the top and sprinkle the sea salt from about a foot above the dough (just to disperse the salt evenly). If you desire you can add other toppings like minced rosemary and you can dimple the dough with oiled fingers for a classic look. Bake for 15-20 minutes, until the dough is a golden brown color. Remove from the oven and eat immediately or let it cool and serve later. I’ve heard pigeons adore it. This entry was posted in Breads, Uncategorized, Vegan and tagged authentic Italian focaccia, focaccia recipe with mixer, long rise focaccia, perfect focaccia recipe. Bookmark the permalink. Yeah, I was there, and was wondering how to ask about taking the last piece of that foccaccia home. The pigeons saved me from the embarrassment of having to ask, but I was ready to kill them to get that foccaccia back. Fantastic, AM! It may just be the thing to finally convince me to buy a standing kitchen mixer. Pigeons do taste pretty good in B’stilla….. Yes, get a Kitchen Aid! Ciao. I am a friend of Sandra’s who turned me on to your blog. I have already made some of your recipes and have to say, you are doing an amazing job. My husband is Tunisian and I am Italian I find your recipes a great mix of the Arab/Mediteranian cultures. I am in awe at how you have time to do this with kids. I have two as well, 3 and 8 and work full time and would love to start something like this, but I am just too tired. My kids helped make the pine nut cookies with me and they were delicious. We drink lemon verbena tea all the time. Please keep sending out these yummy recipes. Ciao for now. How nice and thank you for commenting. I am so glad you are enjoying it. Yes, it is a lot of work, but it has been so much fun to do. I tend to squeeze in cooking and photographing during the daytime or right as we are sitting down for dinner, but the posting takes much longer and I do it in the late hours of the night (morning). Sometimes I find I need this as an outlet more than sleep! Thanks for the nice words. 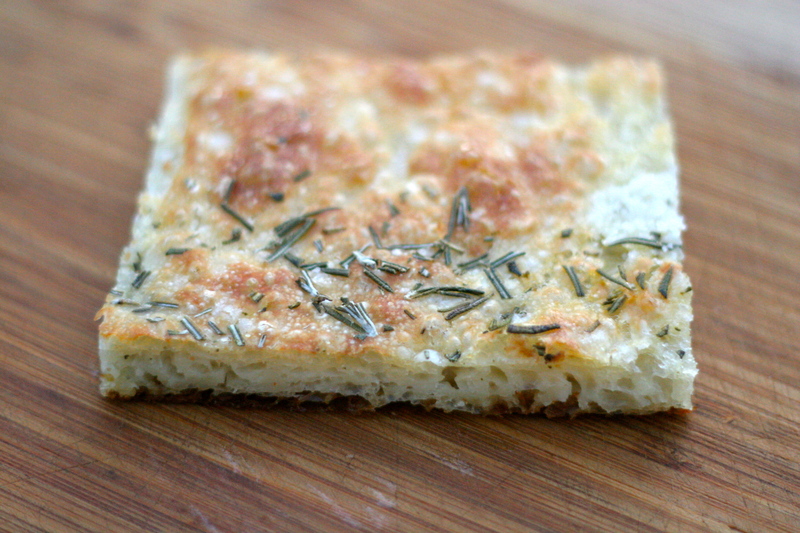 Spectacularly good focaccia….indeed to dream about!!!! how does the baking stone fit into this recipe? you have the dough on a cooking sheet, and then you put it on top of the heated baking stone? I am new to bread, so maybe this is something basic to bread baking? Exactly. Leave the dough in the rimmed cookie sheet–it is very wet, almost like a pancake batter, which is how it gets its incredibly crunchy outside. The preheated stone distributes immediate perfect heat to the cookie sheet. It’s as close as you can get to using a wood-burning oven with bricks or tiles, which is what the artisan bakers use. Let me know how yours turns out. Wow! A week of focaccia translates into many happy neighbors and friends, huh? I will try your recipe soon. 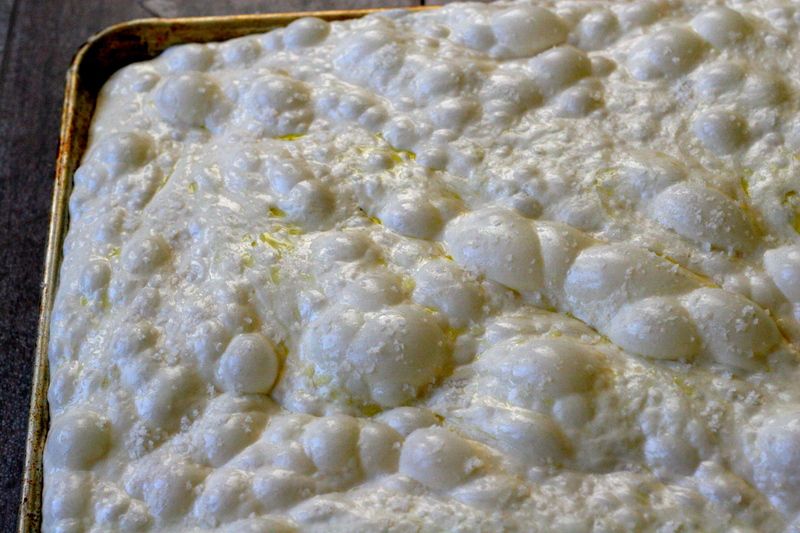 At the moment I am caring for my own homemade yeast starter and my next project is to make focaccia with that. Thanks for sharing. Hi, I followed your recipe and it turned out great! Thanks so much! I wanted to ask, if I were to add Parmesan, at which stage should I include it? At the beginning, after the first rise, or at the very end after it’s baked? Your choice. If you want it infused in the dough as opposed to caramelizing on the top, mix it in at the very beginning. I would probably add it after the first rise. I would not, however add it at the end because it would deflate the lovely height that you accomplished. Hope it’s delicious! What, no biga? I usually start with a biga. Looks like a really nice dough, though, going by the pic.